Welcome to your fifth week of the challenge! At least 4 days of logging your food in a food journal or in MyFitnessPal. At least 4 days, first thing in the morning, spend 5-10 minutes writing something down you’re grateful for. At least 4 days spend at least 10+ focused minutes attempting to meditate. At least 3 days of 20+ minutes of reading (not on a screen). Whether it's a book, newspaper, or magazine, take 20 minutes to learn something new, connect with the world in a different way, or connect with a different world entirely. Success Tip 1: think big. Thing you. I won’t do a better job at addressing the topic of identity-based habits than James does himself, so I would highly encourage you all to read his article. Short read. Eye-opening content. That said, there are a few points that he makes about habits that apply directly to what we’re trying to do in the Total Health Challenge, which I’ve outlined below. Most of us entered the fitness game with a specific goal in mind. Maybe we wanted to finally lose some weight. Maybe we wanted to get big and strong. Maybe we wanted to be better at our sport. Maybe we just wanted to feel better, more capable, and more ready to handle everyday life. Knowing your why is important at every step of the journey. It keeps you focused and helps you see the bigger picture. 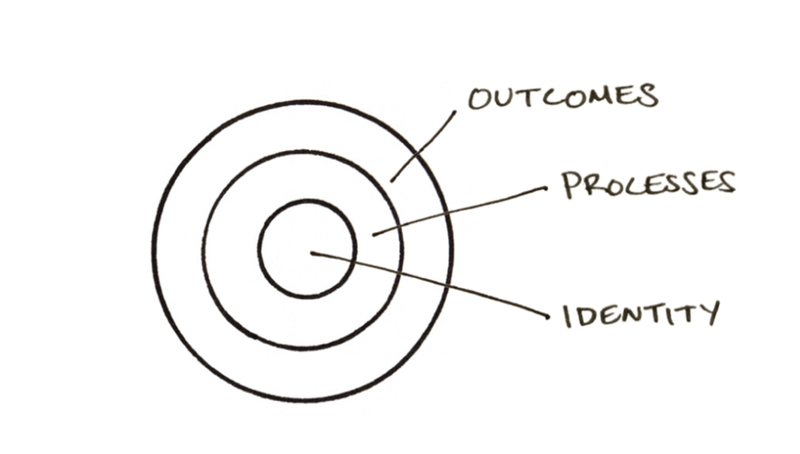 Whatever your goals are, it’s important to think about what reaching them does for you in the short-term and in the long-term. Say you lose 20 pounds — that’s awesome! But now what? You like the way you look in the mirror, the way your clothes fit, and the way you feel, but are you a different person now? Does the weight stay off? If you really believe in your ability to keep the weight off and make being healthier part of your daily life, you can bet that the changes you make will last. Commit to more than just a goal, commit to your new identity. You’re not just a person who lost 20 pounds or added 50 pounds to their squat. You are healthy. You are strong. You are fit. This is who you are now. For change to really stick, you have to look bigger than numbers on the scale or on the barbell. You have to look at what your life looks like as a stronger, healthier, happier you. More often than not, cruise control gets us exactly where we don’t want to be. Do we want to be 20 pounds down for a month, or do we want to be 20 pounds down for life? If the latter is our answer, we have to think bigger, more long-term. A boat sailing off into the distance doesn’t fall of the face of the Earth once it reaches the horizon. It keeps sailing, and so should we when we imagine our lives after we reach our goals. From the twinges of pain we get during or after training, to the comments we get from friends, colleagues, teammates, or certain healthcare professionals, there are signs everywhere telling us to stop being active. Here are some common lines we’re fed on a daily basis, and short responses that can put us at ease. Um citation desperately needed. The most common injury in the weight room is dropping a weight on your foot. People do not spontaneously snap in half or combust under a barbell. Popping and clicking are not reliable indicators of pain, dysfunction, or damage. If you’re sore, you probably did something new or you did more work than you’re used to doing. You are not “wrecked”. You will adapt! Also, if you expect to be sore, chances are you will be. Your expectations actually play a big role in your experiences of pain, or even healing. Outside of an extremely small subset of the population, being more active than you currently are is better for you, not worse. What about “X” asymmetry or “Y” popping or “Z” abnormality on MRI? Don’t those explain my pain? Disc herniations, leg length discrepancies, scoliosis, kyphosis, and other anatomical asymmetries are not slam dunks for pain. And get this, they’re normal in most of the population. Yup. Most of us right now are walking around with some sort of abnormality on MRI, yet we don’t all have debilitating pain. Pain is super complicated, and contemporary pain science is steering us more and more away from structural issues as the cause of our pain. The biggest takeaway is this: pain is complex, we are stronger and more adaptable than some would have us believe, and training is making us better, not worse. Counter to conventional thinking, the more we embrace movement and exercise and the less afraid we are of our bodies, the less pain we’re likely to experience. You are not broken. You are more than likely just adapting. This week’s recipe comes to us courtesy of Patty H, via the Team Facebook Page! Seafood might be intimidating for some folks, but this recipe couldn’t be more simple. 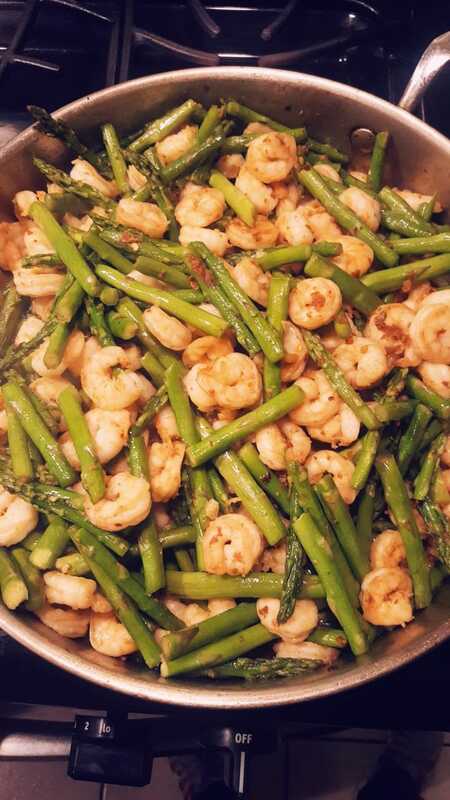 Simply add your seasoned shrimp and asparagus to a lightly-oiled pan and cook for 3-4 minutes — that’s it! You’re left with at least two meals worth of food, clocking in at 30g of protein and less than 300 calories each!